The eager learning attitude of the young Emperor however infuriated the elder generations at court, most of whom loathed the "Foreign Devils" and most of all the British for invading and subduing their Empire and leading to their near downfall in the first place. Thus, all of these developments were fought almost every step of the way by the more conservative minds in charge at the Imperial Palace, especially the remaining Empress-Dowagers and others who's status wholly depended on the presence of the Emperor Xuan Tong (Pu Yi) in the Palace. Eventually however, even they had to make at least a partial turn-about and let the Emperor have his ways. 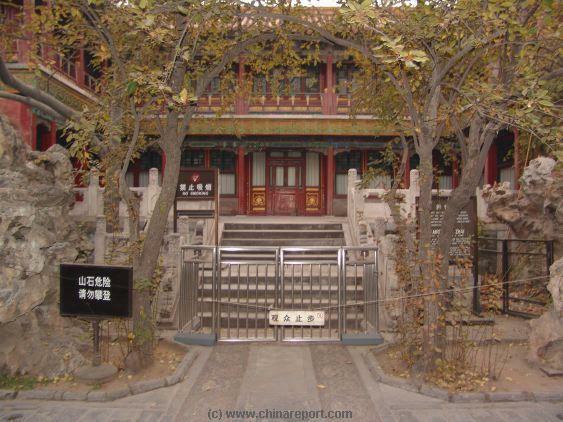 The Study or also "Lodge" of the Cultivation of Nature - Yang Xing Zhai (养性斋) is one of the many Palaces and Pavilions found inside the Palace Museum (also: Forbidden City) in China's Capital Beijing. 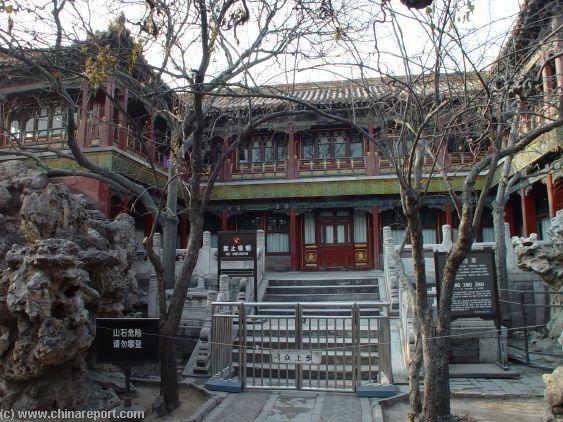 The Lodge of the Nourishment of Nature (养性斋) is found in the south-west corner of the main Garden of the Palace Museum (Yu Huan Yuan) and stands due West of the Gate of Tranquil Earth (Kunning Men) which gives access to the so-called "Central Palaces" of the private dwellings of the Emperor and his extended family in the Nei Ting, the Inner Court. 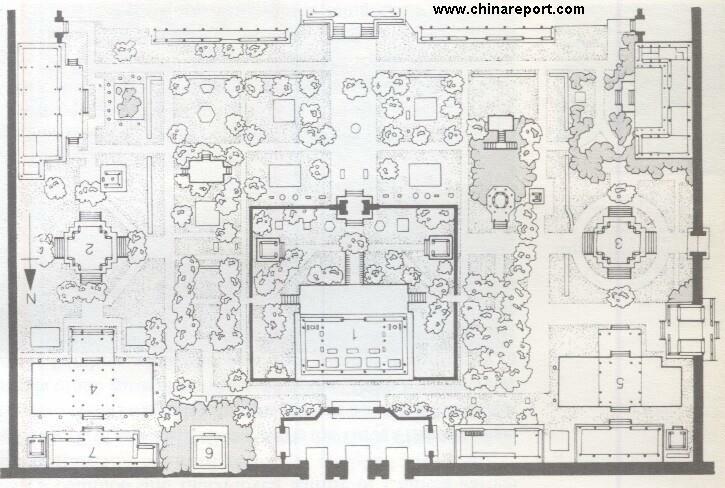 The Palace Garden and the Yang Xing Zhai - Lodge of the Nourishment of Nature are also part of this "Inner Court". To get to the Inner Court (Nei Ting) and the Lodge of the Nourishment of Nature, the shortest route is to go to the North Gate of the Imperial Palace, the Gate of Divine Military Might (Shenwu Men), which looks out northward upon the grandiose view of the Jing Shan (Coal Hill), formerly an exclusive Imperial Garden but now the public park of Jingshan. View of the Study of the Cultivation of Nature partially hidden behind rockeries and set inside the Palace Garden (Yu Huan Yuan). The Upper Floor and Roof of the Wooden Structure viewed over Rockeries of the Imperial Garden. The closed off entrance and white marble stairs leading into the Study or Lodge of the Nourishment of Nature. Surrounding rockeries of the Palace Garden and the Study o/t Cultivation of Nature building. Pathway to the Western Palaces of the Inner Court leading from the Garden past the Yang Xing Zhai Study. The Front of the Study of the Cultivation of the Mind with its rockeries.The Rockeries make this Garden Pavilion an especially private place and the 2nd floor gives a good overview of the Garden. The Lodge of the Nourishment of nature was fully restored together with many other structures of the Palace Museum in advance of the 2008 Beijing Olympic Games. 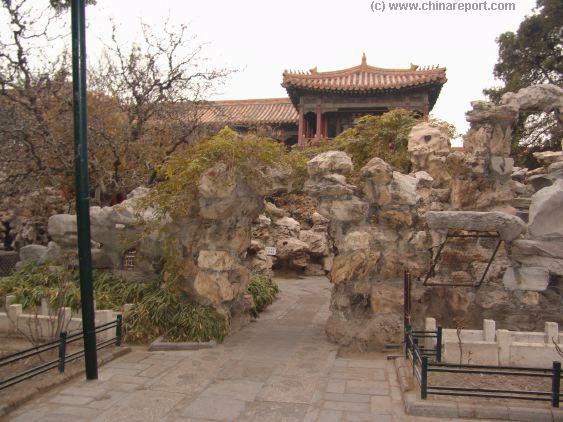 Today the Lodge of the Nourishment of Nature is usually closed to those ordinary citizens who visit the Palace Museum, so they can only admire the exterior of its large two storey structures, its rockeries and a view of its white marble terrace. Only on rare occasions, visitors are allowed to stand on the white marble platform or have a look around inside the building. Pu Yi's forced leave of the "Forbidden City" at the hands of a revolutionary army in the year 1924. 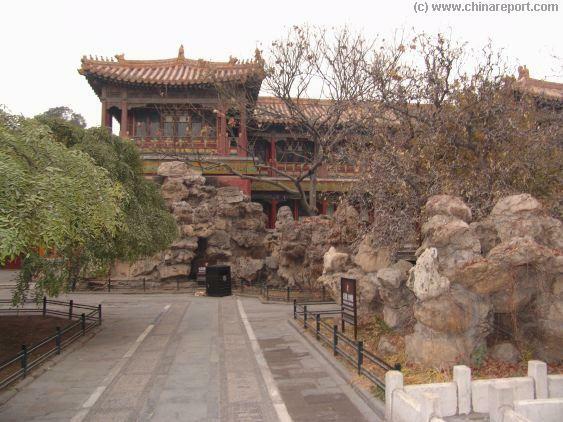 Here, wide spacial promenades lead to the East and West, passing along the inside of the huge purple walls while to the South one is faced with the colorfully decorated Chastise Obiedence Gate (Chun Cheng Men). 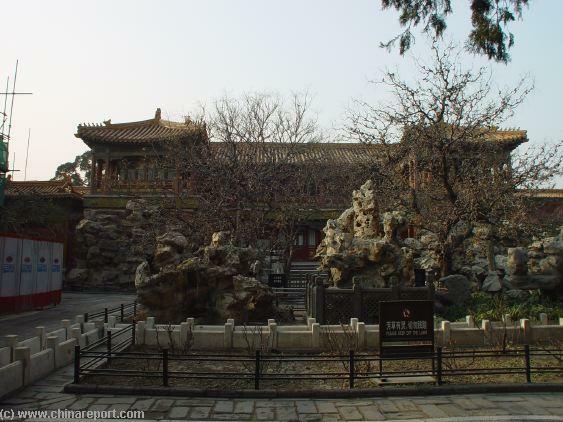 After appreciating its incredible and elaborate glazed tiling, Pass through the Chastise Obiedence Gate to enter the fairly large main garden of the Palace Museum, the Yu Huan Yuan. From here its is just a short walk over to the Lodge of the Nourishment of Nature. Choose the path to the right (westward and away from the Hill of Soaring Elegance (Duixiu Shan) and walk in a semi-circle through the Gardens to find the two storied structure in the classical Ming Dynasty Style of the Lodge of the Nourishment of Nature. On your way through the Garden you should be passing the 10 thousand Springs Pavilion (Wan Chun Ting) and the Pavilion of many Autumns (Qian Qiu Ting). 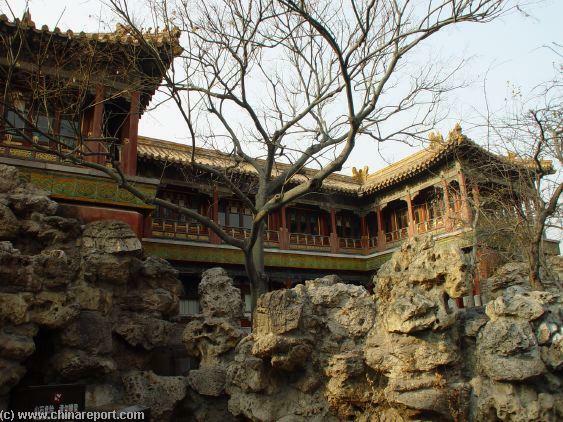 The Study of the Nourishment of Nature is located in the South-Western Section of the Palace Garden (Yu Huan Yuan) and stands adjacent and overshadowing the south-western gate into the Western Long Corridor, the passage to the Inner Courts' Western Palaces. The Lodge of the Nourishment of Nature is a two storied structure in the classical Ming Dynasty Style and of a unique design in the shape of a Chinese Caracter 凹 (āo). Its flamboyant style is however mirrored in the design of the "Pavillion of Crimson and White" which is shaped in the form of the "opposite" Chinese Caracter 凸 (tū) to keep in line with the otherwise symetrical arrangements of the Imperial Garden. The building itself stands atop a two layered white marble platform of about 2 meters high, has a central veranda and a fly over on the second floor connecting to the entrances of each room on that floor. Above: Map of all structures found in the Imperial Garden of the Palace Museum (Forbidden City) - The Chastise Obience Gate stands in the South and the Gate of Tranquil Earth in the North. The Square structure in the center represents the Palace of Imperial Peace. After reaching Shenwu Men, the North gate, purchase your ticket to the Palace Museum and head through the tunnel of the majestic Shenwu Men to wind up the large open space behind it. the Qing Dynasty (1644 A.D. - 1911 A.D.), who often came here to rest or seek some privacy and quiet to read a book. The last person of historic importance to make use of the Study was the now famous Tutor to the Dragon Emperor, Sir Reginald Fleming Johnston. Johnston was assigned the job of teaching English to the boy Pu Yi in the year 1919 and carried on teaching and tutoring (and advising) the Last Emperor of China until the day of he was driven out of his home in the Forbidden City by troops of General Fen Yixian. During his assignment as the Tutor to the secluded last Qing Emperor Sir Reginald Fleming Johnston was the only westerner allowed inside the Palace, leaving him a unique witness to this period in China's History. He left a unique account of the Court and the Life at this court in his Book "Twilight in the Forbidden City". 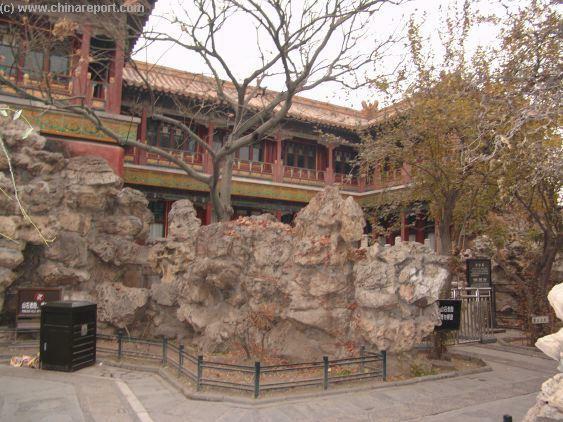 The building is fronted by several large rockeries who's grotesque shapes partially shield it from views from the grounds of the Imperial Garden. On top it has a ceramic golden yellow tile roofing, golden lining and is adorned with various other colorful ceramic decorations. Apart for its old age and original Ming Style, the Study of the Nourishment of Nature most noted for having been (given as) "A Gift to Reginal Johnston from Emperor Pu Yi", or as Johnston himself reveiled "according to the Palace Eunuchs and Dignitaries it was a unique gift, the giving of which had never occured previously during the entire history of the Palace" (I.e. 1420 A.D.). As the private office and residence of his now esteemed British Tutor, the Emperor had the buildings interiors thoroughly refurbished. Although today these interiors remain hidden from view for most, if not all, visitors to the Palace Museum, at the time of the renovation in 1919, no expenses were saved to give it the high quality European style furniture thought to be required. Another Palace Hall noted to have been "re-done" in the European Style is the "Hall of Beautiful Vista's", a part of the Western "Palace of the Gathering of Excellence (Chu Xiu Gong)", one of the residences of the Empress-Dowager Hsu-Tzi (Cixi) during her lenghty career in the "Forbidden City". The student Emperor arrived with even more pomp also by sedan chair, and after a ceremony in which the Emperor invited everyone in, the doors were closed and the teaching could finally begin. "English Class" started at around 13: 30 PM each day. Apart from teaching the English Language, Reginald Johnston also used to the time available to inform the otherwise oblivious young Emperor of matters concerning the outside world, geography, some world matters and politics as well as a large dose of "English Culture" which involved many stories about the Life and attitude of the British Monarch, at the time King Edward, the Prince of Wales. The structure of the Study o/t Cultivation of Nature stands atop a two-tiered white marble platform lined with white marble fencing with corner poles engraved with patterns of dragon's frolicking among clouds , one of the features signifying its high imperial importance. Frontal view of the entrance to the Study of the Nourishment of Nature from the Palace Garden. Prince Pu Cha was then nicknamed "Arthur"and the Emperor adopted the name of "Henry" for the first time. The young brother Pu Jie was given the equally "Royal" name "William" by Pu Yi. At a much later date, to be precise on October 20 of 1923, Tutor Johnston introduced the young Emperor and his classmates for the first time to the Game of Tennis, which was demonstrated in the grounds of the Imperial Gardens across from the Class-room at the Lodge of the Nourishment of Nature. After picking up a habit of playing tennis, Pu Yi often used the space atop the platform in front of the Hall of Supreme Harmony (Taihedian) (in the outer court) as his tennis court, although in his final months at the Forbidden City in 1924, the Hall of Established Happiness was burned down by the eunuchs in an effort to cover up their large scale larcenies and finding it sufficiently big, the space formerly occupied by this Hall was converted into a full flung Tennis Court. dress, cutting off his mandatory "Manchu Que" and later wearing spectacles to improve his poor eye-sight. Apart from westernizing his own person, the young Emperor also moved to have telephone installed in his home at the "Mind Nurturing Palace" and learned how to ride a bicycle after Johnston had introduced him to one. As Pu Yi enthusiastically widened his horizon he started driving his bicycle around the Courts and corridors of the Imperial Palace and the Emperor ordered all wooden "footboards" to be cut out of the Gates of the Inner Court in order to facilitate his efficient moving about. 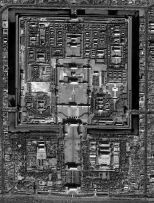 Satellite Image Map of The Forbidden City - All structures within the Palace Museum of Beijing. book "Twilight in the Forbidden City", it was this Palace that served as Johnston's Office during his daily times at the Imperial Palace. Although the main classroom building was the aptly named main hall of the "Palace of Bringing Forth of Blessings" located not too far from the Palace Garden, after teacher and student came more and more befriended Johnston often wound up teaching his "English Lessons"
in more private one on one evening sessions at his office, the "Lodge of the Nourishment of Nature". As for his official job as the English Teacher to China's abdicated Last Emperor, the boy Pu Yi (Emperor Xuan Tong), in the accounts he has left us, Johnston clearly states that at night time he would reside elsewhere, to return each day, often on horseback, and enter the Imperial Palace through its Northern Gate, the Gate of Divine Military Might. 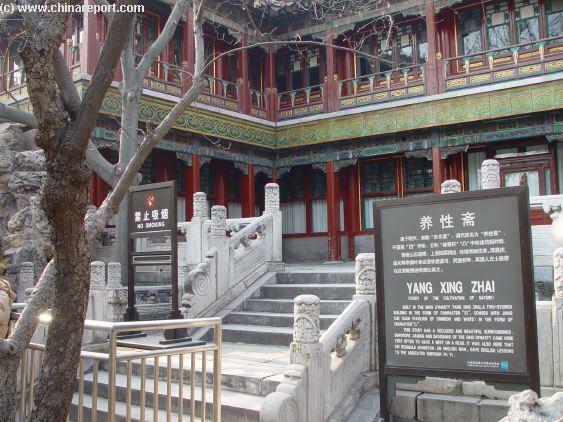 From there he was carried in a sedan chair to the class-room at the "Palace of Bringing Forth of Blessings (Yu Qing Gong)". efforts to "civilize" the Chinese Emperor and molding him more into the form of "an English school-boy" Johnston threw several "gentrification"dinner parties at his elegant Lodge where he not only entertained Pu Yi, but also had arranged for the Empress Wan Rong to be chaperoned by her elegant American Tutor, Miss Isabel Ingram. Just before the eviction from the Palace critical voices within the British Legation muttered that Johnston behaved like an old style Confucian Regent eventhough the Emperor abdicated many years ago and China was now a Republic. According to them "Johnston held court at his big Pavilion every day". Johnston was however never allowed to stay overnight at the Palace something which would have simply been unthinkable. 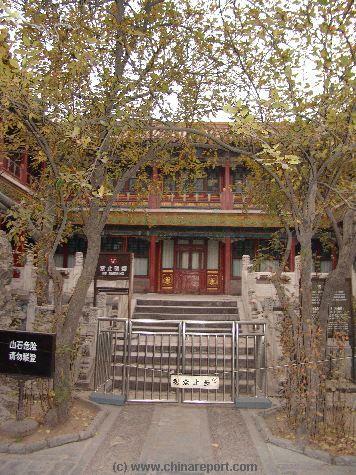 Remarkably, after the eviction of the Emperor from his Palace in 1924, Johnston continued to have his office at the Lodge while being assigned the grand guardian of the entire "Summer Palace (Yiheyuan)" (today found in the north-western Haidian District), within which he also had his assigned quarters. A third "home" of Johnston was located within the Western Hills of Beijing near a village called Yong T'Ao Kou. He soon dubbed it his "Cherry Glen".